is asked to sponsor a Memory Box in memory of a child. I also offer Baby Loss Bears and Miscarriage Gift Bags. It’s been a long time coming but I’ve finally put together information about the baby loss memory boxes I’ve been making in memory of my children in Heaven. Many have been asking for details so here they are! I’m excited to share this with you. I don’t have the words to fully explain what it’s like to give birth to three beautiful children and watch them die in your arms. Mommy misses you Alice, Elliot and Alexis. This is a pain nobody should have to endure and yet too many do. Although I received some of the most beautiful clothes and blankets for my children (thank you Threads of Love) not everyone is blessed with these gifts for their children. I’m forever grateful for what I received yet after meeting other loss parents I realized that there were so many resources that could have helped me during the most painful time of my life. I wanted to give back in memory of Alice, Elliot and Alexis and try to fill the empty arms of other parents leaving that silent hospital room. It started with five bags donated on my triplets’ first birthday. I knit a blanket for each similar to the one I had received. I added some soft kleenex, a candle and a few beautiful loss books. Months later I found a sale on photo boxes at Michaels. I had purchased a similar box for my babies’ keepsakes before their funeral. I filled my cart with boxes. I stumbled upon some beautiful ceramic birds and had to have them. I added ribbon, stickers, flower seeds, photo albums and candles to my cart and checked out of the store that day with a mission and hope that I could help another grieving heart. I started building my boxes and was blessed with help from my friends at church. We gathered one evening and put them all together with love and prayer for each life that those boxes represented. I was able to include the loss book Empty Arms thanks to a donation from author Sherokee Ilse (thank you!). I donated fifteen boxes (including several for multiples like my children) to the hospital where my babies were delivered in time for the one year anniversary of their due date. Months later I kept knitting and gathering supplies for more boxes. My sister-in-law Amy graciously offered to make flannel blankets and purchased many of the supplies for the next donation. I came across a video that another beautiful loss mom, Carly Marie from Australia made to show how she makes her memory boxes. Feel free to watch if you’re interested in doing this in your area! She had moisturizer on her list of items to include. What a beautiful idea to have a scent connected with the memory of your child (for me it’s the soap my dear friend had given me for the hospital room while I was on bed rest). I reached out to Emilie, creator of Baby Loving Mama and JOHNSON’S® BABY CARES Council member. 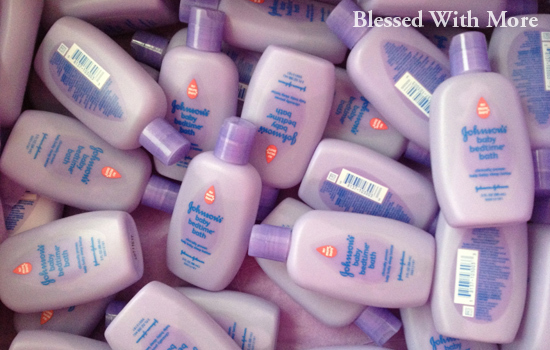 She contacted Johnson & Johnson with a request for small lotion bottles in their lavender scent. I was so honored to learn that they’d be willing to send a donation for my memory boxes! Thank you to all of the family and friends who have helped me put these memory boxes together. Thank you Johnson & Johnson for giving the gift of a beautiful scent to the memories of these grieving parents. I hope you’ll consider continuing this beautiful gift in the future. Have you suffered the devastating loss of a child? I’m so sorry if you have. If you’re able to give $20 (or more), I’d be honored to create a memory box to be donated in memory of a child/ren you’ve lost. Consider making a donation below with a simple click and include the name of your child in the notes. Lindsey Henke from Stillborn and Still Breathing sponsored the beautiful box below for her daughter Nora and even sent a hand written card to be included in the box. This project is fiscally sponsored by Star Legacy Foundation (a non-profit dedicated to stillbirth research and education) and your donations are tax deductible! I’m hoping to include grief resource books in the future if you’re willing to consider a larger donation for this. Of course if you’re more of a hands-on person you can make some memory boxes of your own and contact your local hospital to drop them off. It’s been a beautifully healing process for me. If you sponsor a box through our donation link, please be sure to make note of whom the box is in memory or honor of. This name will be included on a card in that box helping these families know that they’re not alone. If you’re in touch with other sponsors (such as the Johnson & Johnson lotion) who might be willing to donate materials or items for these boxes please contact me. I’m also looking for the following items to be included in boxes. Each box is unique but please consider buying in quantities. Hand knit/crocheted baby blankets, hats and burial gowns of varying sizes from about 20 weeks to full term (Here is more information from Star Legacy as well as premie sizing and some patterns.) Keep them soft and flexible fabric/yarn. Consider a stretchy or rolled/folded edge on hats so they can be adjusted easily. Gender specific/neutral colors are welcome. Flannel blankets. These can be either store bought or hand sewn. I include as small as 17″x17″ up to full term size. Keep them soft and thin so they can be swaddled and folded if necessary. Please keep fabrics appropriate with small patterns and soft colors so they don’t distract from baby in pictures. Remember this is likely the only item they’ll be photographed in apart from a gown. Sturdy ceramic birds, wooden butterflies/dragonflies or memorial items such as angels. Soothing or unscented candles. Please keep them votive size if possible and enclose in a plastic bag if shipping with fabrics. Forget-me-not flower seed packets. *We’re heading into the winter months and I’m having trouble finding these right now. Small photo albums to encourage families to take pictures. Please contact me here if you’re able to make a materials donation of any kind. I fully recognize this is about more than my children and the hospitals in my area. If you’re feeling inspired and want to give back, find a group of friends and consider doing this for a hospital near you! It’s often the smallest gifts that mean the most. Disclosure: I received no compensation for this post. All thoughts remain my own. To read more about Emilie and Johnson’s Baby Cares council visit her blog Baby Loving Mama. You have inspired me to do this for my local hospital if they don’t already have someone doing it. So thank you. I’m so glad to hear that! I encourage you not to put pressure on yourself. Do as little or as much as you’re able when you know your heart is ready. My first donation was five simple gift bags. God bless you! These are amazing Janelle. I’m sorry for you and the many others that suffer from such a tragic loss. Bless your heart! This is a beautiful mission. I will be making some for the hospital where I lost my daughter. There was a nurse there at the time who took pictures and foot prints for me. I would not have had anything to memorialize Sophia without the TLC of that angel nurse. It is time to pass the love forward. Thank you for the inspiration. I’m so sorry for your loss Lauren. I’m glad to hear that you’re in a place where you’re able to give back in her memory. One little life can truly make a difference if you let that love spread to others suffering this loss. I’m happy to help if you have questions about anything for your boxes. I’d love to see a picture if you’re able to share!